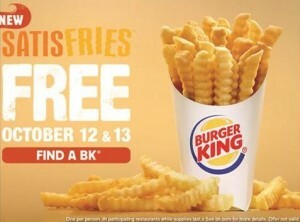 Free SatisFries @ Burger King- Oct 12 & 13!! Stop by your local Burger King on October 12th or 13th to get a FREE value sized order of the all new SatisFries! No coupon required! Offer limited to one per customer.